Nico magazine is published out of Luxembourg under the auspices of Mike Koedinger Editions, one of seven publications produced by the Grand Duchy’s leading independent publisher. With Koedinger’s background in limited edition publications, this probably explains why this biannual title has such a special collectible feel about it. A bilingual magazine in French and English, put together by an international team, its strap line is ‘interviews & fashion’. In reality, Nico has a very different feel to it compared with many other magazines that cover roughly the same territory. Feeling more like a journal or book, its overall tone is one of stylish sobriety and intelligent chic. Its content is as much about contemporary life or even current affairs in the great documentary tradition as it is about the interesting personalities it profiles. There are seldom the same old celebrity faces in Nico. Its emphasis is on interesting ideas rather than hierarchies of fame. The whole is pulled together by a restrained art direction and top quality in the production of the sumptuous images within. Mike Koendinger Editions is also the company behind producing the highly respected biennial Colophon conference/event celebrating the best of international independent magazine publishing that last took place in Luxembourg City in 2009. The tone of the title seems entirely in keeping with broad interests way beyond one or two niches within the fashion or art worlds, so perhaps there is a connection between this quality and what would drive an enterprising small company to invite the world’s top independent magazine publishers to bring their wares and ideas to the tiny realm every two years. Nico has a tradition of illustrated rather than photographic covers. Although there are some who still believe that there is no point in putting out any magazine that covers fashion unless it has a strong photograph of a model on the cover, Nico has persistently proved that in the right hands, the traditional discipline of illustration can be just as powerful. This point is once again reiterated by the stylish depiction of a svelte lady in deep perspective on the most recent cover. This time it is the work of the Amsterdam-based Finnish illustrator. Kutaa Saksi. Saksi’s style is a unique combination of poppy street art iconography, with nods to the blockish style of iconic Scandinavian illustration from the 1960’s and Japanese underground graphics. As can be seen perfectly from the cover for Nico, he also understands the impact of fluid, flowing line. His impressive list of previous clients ranges from Nokia and Nike ACG to the Finnish Railways and the Gyre fashion department store in Tokyo. 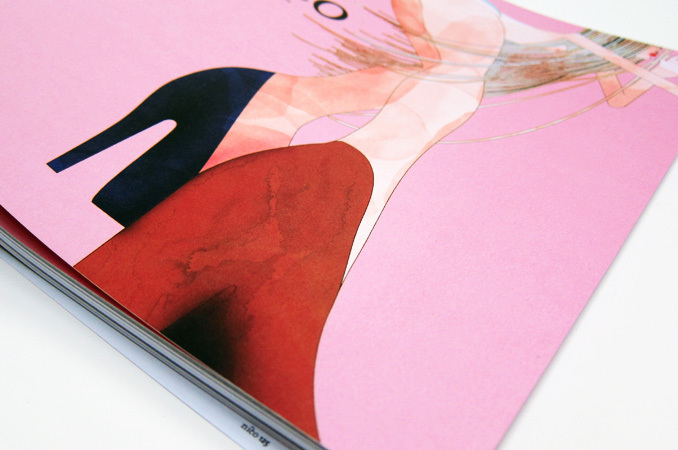 In the case of Nico #05, the bold pink background acts as the perfect framing for the long-legged lovely stretching her legs towards us to emphasise her foregrounded feet. Not only is it a delight to keep any shoe fetishist happy, but one suspects that there will be more than one high-end shoe manufacturer kicking itself at not having intuited that Saksi would be the perfect candidate as an illustrator for making the transition from funky streetwear to illustrating luxury shoes. In his drawing, the shoes are as beautifully captured as the girl.